Apparently this is going to be another blog post with a rambling backstory before I get to the drinking…. This story begins back in February. 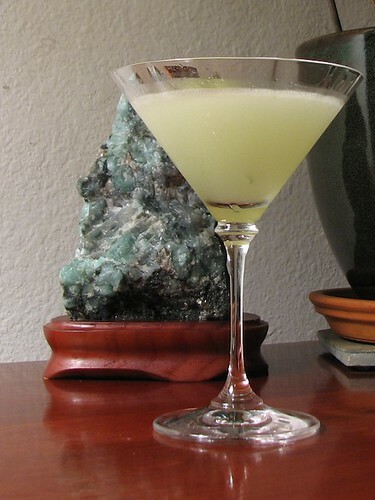 My delightful wife, B-, having given me a bottle of Green Chartreuse for Valentine’s day, emailed me with several websites about a cocktail that used it. Enter the Last Word. Being easily distracted (perhaps by just drinking the stuff straight with an ice cube) I hadn’t gotten around to making it until this weekend. In looking into it, this seems to be a pretty obscure cocktail—only one of my cocktail books even had the recipe in it (Robert Hess‘s The Essential Bartender’s Guide). For those who haven’t experienced the stuff, Green Chartreuse is a 110 proof elixir concocted by Carthusian monks from 130 different botanical extracts, originally as a long life elixir. The monks have been making the current version of green chartreuse since 1764 from a secret formula so complex and carefully guarded that no more than three monks ever know the entire recipe. In 1838, the monks came up with a sweeter 80 proof yellow version., but based on only one tasting, it really didn’t do that much form me. The Last Word cocktail appears on only a few websites (including Drinkboy.com a la Robert Hess), all with the same recipe. The recipe seems to come from an out-of-print 1951 cocktail book called Bottoms Up by Ted Saucier. Saucier gives the Detroit Athletic Club credit for the cocktail, saying “This cocktail was introduced around here about thirty years ago by Frank Fogarty, who was very well known in vaudeville. He was called the ‘Dublin Minstrel,’ and was a very fine monologue artist.” Based on this, the cocktail would date from Prohibition or slightly before. Bottoms Up is cool cocktail book, combining a 270 pages of drink recipes interspersed with vintage pinup art from famous illustrators of the time–so it’s probably not the best cocktail book for children. As a testament of just how cool it is, used copies of the book are currently going for around $200 a copy, but fortunately for me the university library had a copy that hadn’t been check out since 1999. As I was perusing this entertaining tome, I got to wondering who Ted Saucier was and ran across a comment on ADashofBitters blog from a woman name Beverly Scheinberg who worked for him at his PR firm. She describes him (paraphrasing a bit) as a large imposing man who like to eat, “…lived in the past and missed his days at the Waldorf.” Seems like just the kind of chap who should be writing a cocktail book. Give it all a good shake with ice and strain into a chilled cocktail glass. It may just be that modern tastes in cocktails run considerably drier than they used to, but I think this a considerably better version. The sweet and sour from the Maraschino and lime are a little more in check and some hints for juniper from the gin sneak through while still leaving the Chartreuse as the strongest flavor in the cocktail. In fact, one could probably even cut the Maraschino back to 1/2 oz, but then its character would likely be lost and you might as well go to simple syrup. Finally, I would like to thank Alchemist George for his recommendation of Flor de Cana (literally Flower of the Sugarcane), a 4 year old Nicaraguan light rum with significantly more character than some of the other mainstream light rums. He claims it was recommendation of Jeff “Beachbum” Berry, who’s opinion on all matter rum, I’m willing to take. Thanks for the suggestion. I made a regular daiquiri this weekend to try it out and I think we have a new standard light rum.